The Franklin Dairy was born from the merging of five dairies located in "les Cantons de l'Est". 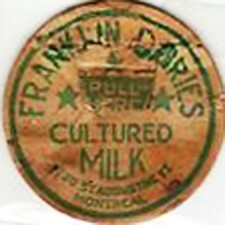 In 1933, the Franklin Dairy was acquired by the Mount Royal Dairy. - Source : Héritage Montréal. 1926 - 1931 The National Dairy is situated 84 St-Augustin. 1929 - 1930 Streets number are renumbered. The 84 becomes 250 St-Augustin. 1931 - 1933 The Franklin Dairy occupied this address. 1934 - 1935 The Peerless Dairy occupied this address. 1936 - 1940 The Ferme St-Antoine Dairy occupied this address. 1940 - 1965 The Coopérative de Lait et Crème St-Antoine Dairy occupied this address.